Ground floor trasparency has been bandied about quite a bit on this site recently. Many might be asking: What is it? What are you guys talking about? I'm no architect, but study after study has shown that the more windows, openings, doorways and other transparent features that a building has at ground-floor, the better. It gives pedestrians more of a sense of "safety and security", is more inviting, and just adds visual interest to the pedestrian environment. 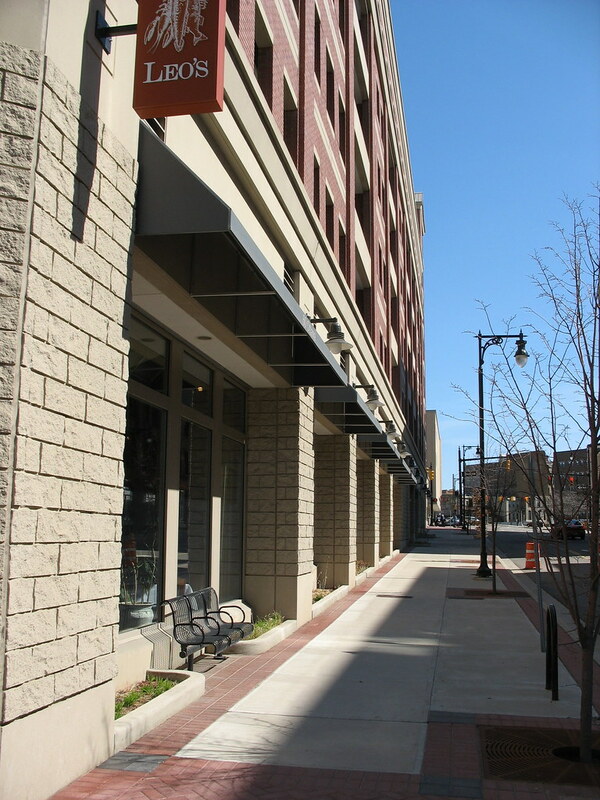 It brings the activities of the inside of the building out to the sidewalk, visually. 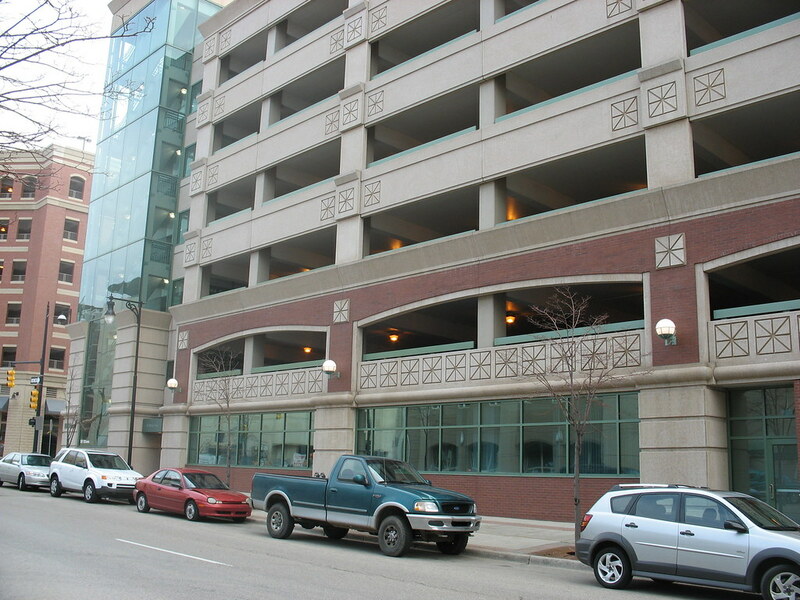 Even parking ramps with windows and openings on the ground floor receive high ratings for pedestrian friendliness. More pedestrians on the sidewalks creates the vibrancy we all want to make downtown a great place to spend time, live, go to school, spend money, work, you name it. 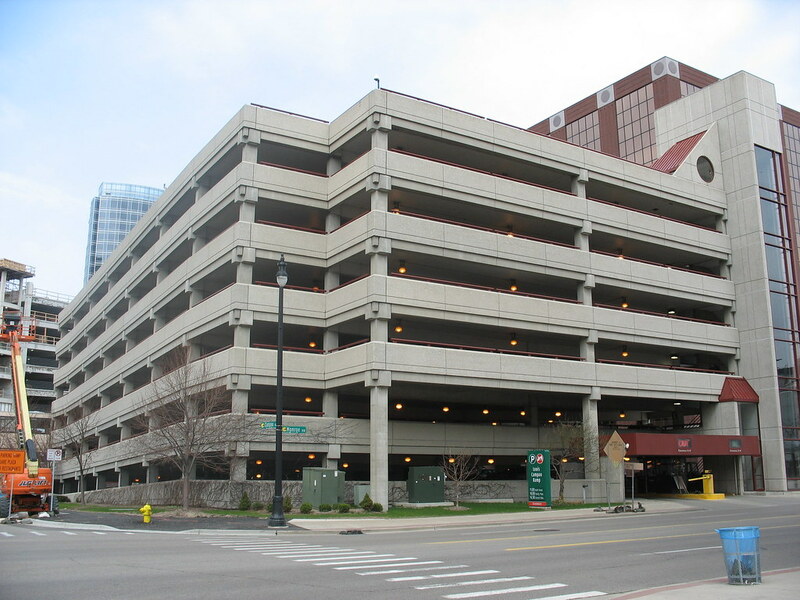 I decided to highlight some of the different parking ramps in downtown Grand Rapids. Some built before ground-floor transparency was pushed for, and some afterward. You decide which ones you like better. Rate each from 1 - 10 for how you feel about them, with 1 being the worst and 10 being the best. We'll start with the Pearl and Ionia ramp. Very poor ground-floor transparency. If you've ever walked in this area, especially along Ionia, have you ever felt the urge to cross the street? How do these blank walls with 0 transparency make you feel? Next we move to the Monroe Ave ramp. A bit better with the openings into the ground floor parking levels, but not much better. 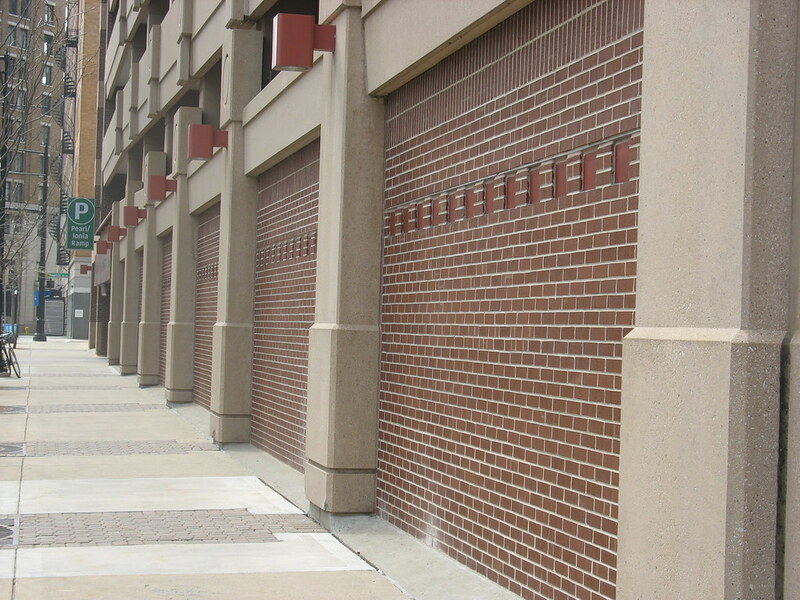 But my guess is being able to see into the parking ramp gives pedestrians a little more comfort than a blank wall would. Now the ramps built in the last 10 years, which have certainly improved greatly. I'm not sure who should get credit (Logie, Jay Fowler, others)? Not fab but not bad. 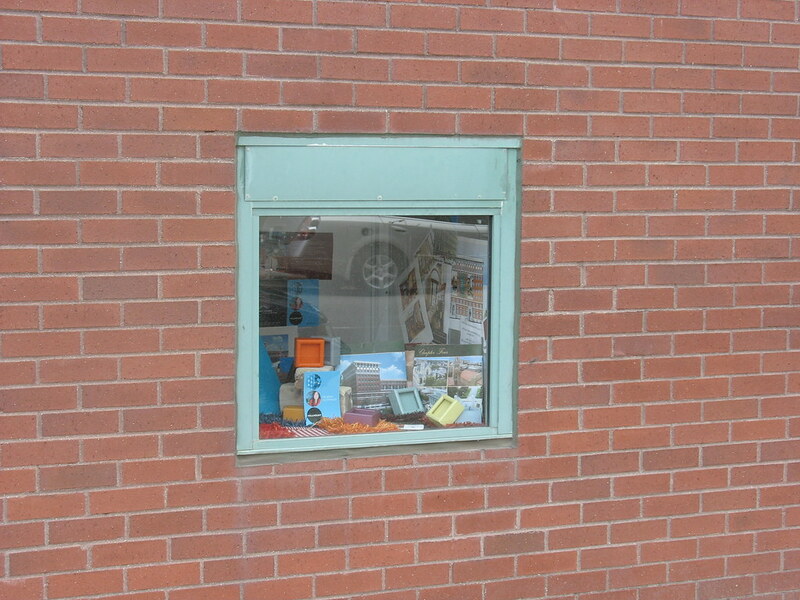 Looks like there are police bicycles in that window (curious minds want to know)? 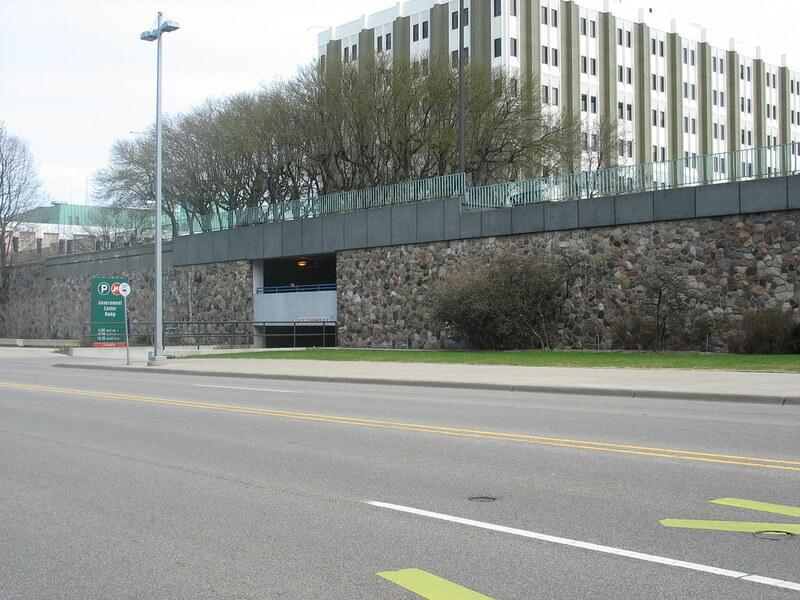 I seem to remember a big fight at city hall about the ground-floor of this ramp getting the proper treatment. Retail would have been better IMO. 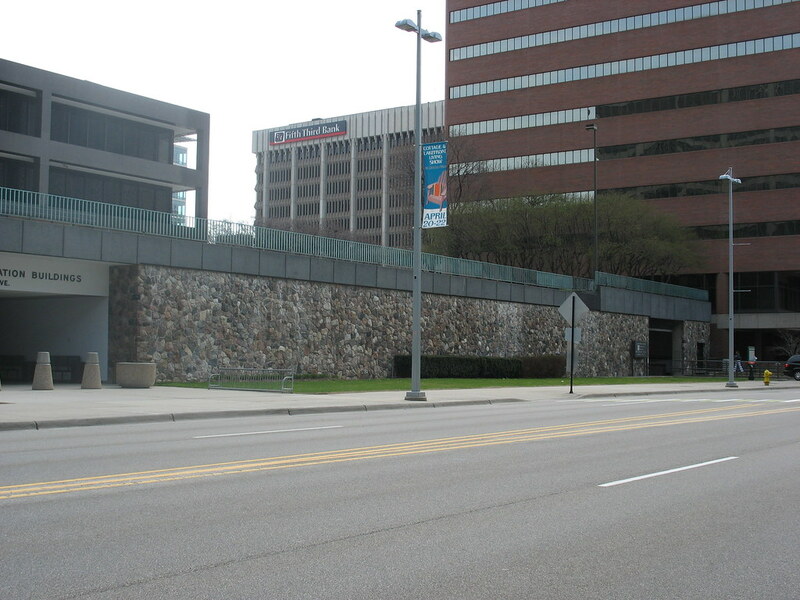 Finishing off with the best of the bunch, the Monroe Center ramp. You'd be hard pressed to find even 20 or 30 feet of continuous wall. It's my feeling that ground-floor transparency requirements need to be increased from where they are today (I believe 60% for all new construction), and should include ground-floor retail in most areas of downtown. 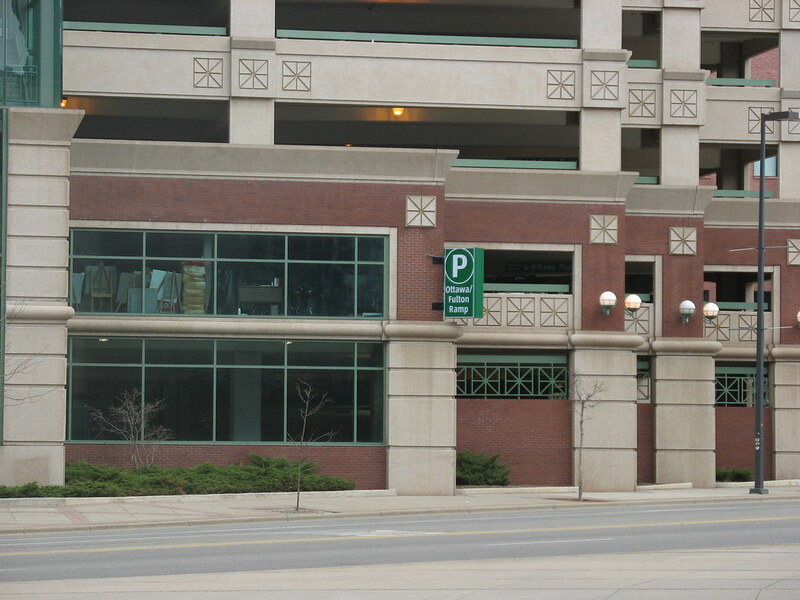 This is by far the best...I have to admit I never even noticed that this was a parking ramp until you pointed it out! Blind of me in one way, but hat's off to the architect in another! It would be nice if all cities took a specific standpoint on ground floor transparency For example, lets say 80% of a building face at street level be windows. 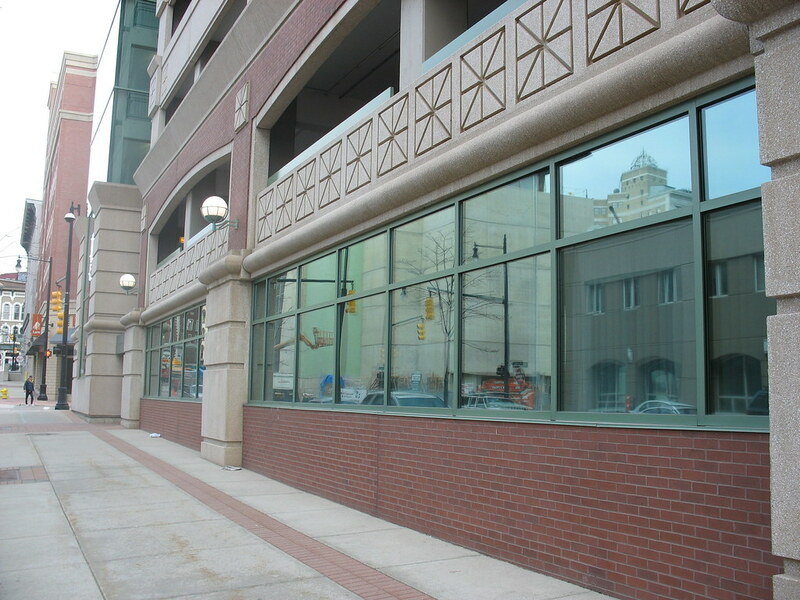 IMO, ground floor transparency doesn't always cut it when making active street fronts. 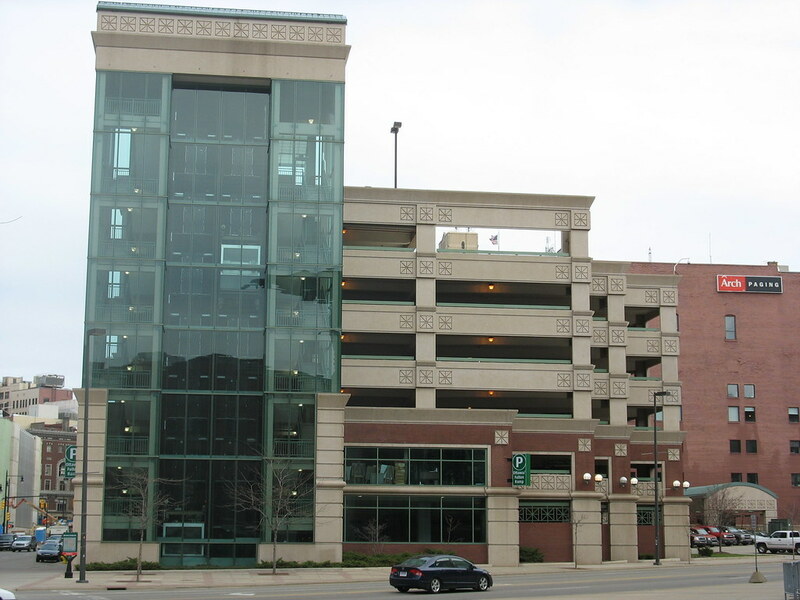 I think all the parking ramps presented are bad. The Leo's example is okay I guess. 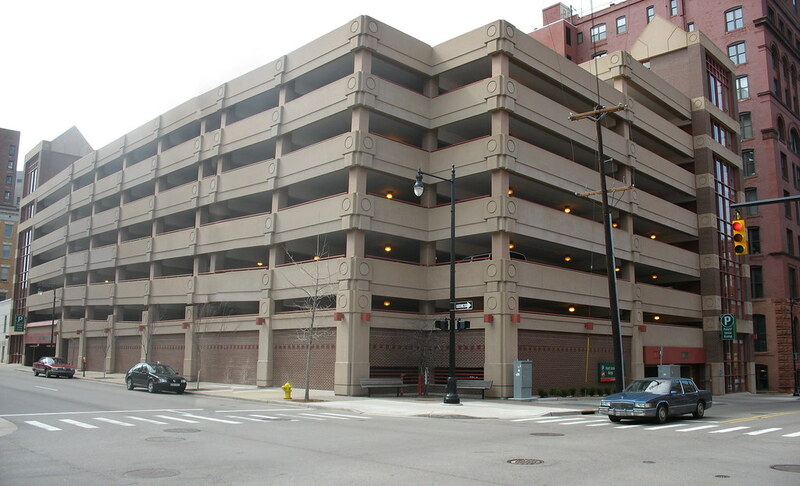 The problem is parking structures are overscaled, and generally have long spans between support columns which as a result causes developers to create commercial spaces that are large. If there was a door to a store unit in every bay in the last example, I'd like it a lot better. The format for ground floor retail space size and shape seems to be different nowadays from the past. Back then, store frontage was very small, but buildings were very deep. So you would have a lot of visual activity because there were so many different businesses packed into one commercial row. Now we have a condition with shallow unit depth, and a lot of street frontage. 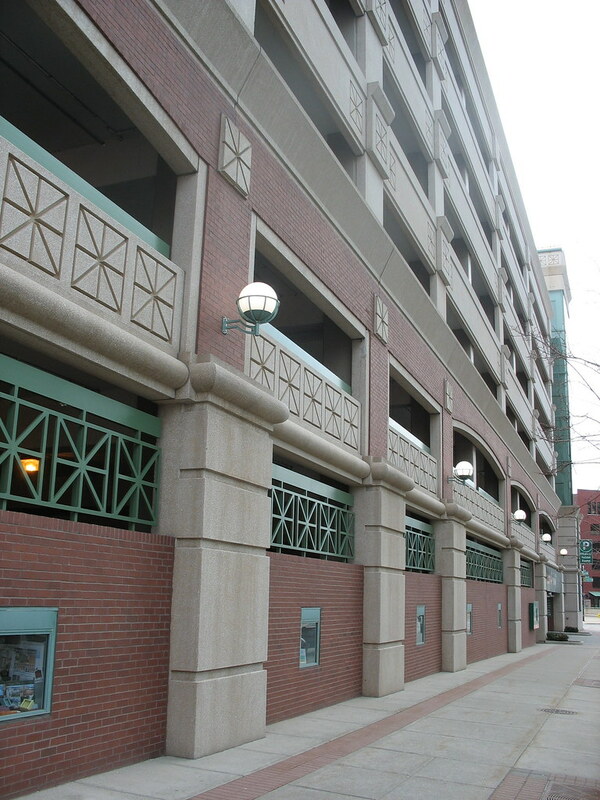 I'm not sure I like that, and that's what I see in the last parking structure example. But I'm off topic here. I basically wanted to make the point there is certain types of "ground floor transparency" that aren't always succesful. The ramp with Leo's is a positive step, but it isn't exceptional. Believe it or not, developers should turn to shopping centers to learn about narrow retail space. If it works there, it will work in a downtown, just like it used to. Fulton/Ottawa and Monroe Center are definitely the best. So what about the new ramp on Commerce? I think it will have a high level of transparency and will look very nice from the street but what about retail? I know that the plan is no retail, but while the the building is under construction, would it really be that hard to add a storefront? I don't know what the ramp layout looks like inside, but even a 2000-4000 sq. ft. bay would help tremendously. 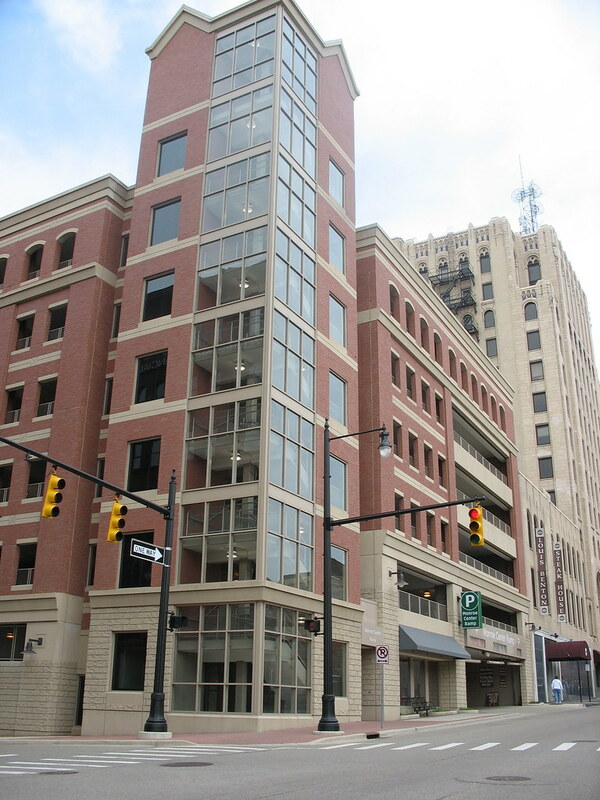 The GR Zoning Ordinance for the Central Business District calls for 60%on the front face and 40% on sides. (5) Facade Transparency. The first floors of all buildings must be designed to encourage and complement pedestrian-scale activity. It is intended that this be accomplished principally by the use of windows and doors arranged so that the uses within the building are visible from and/or accessible to the street. 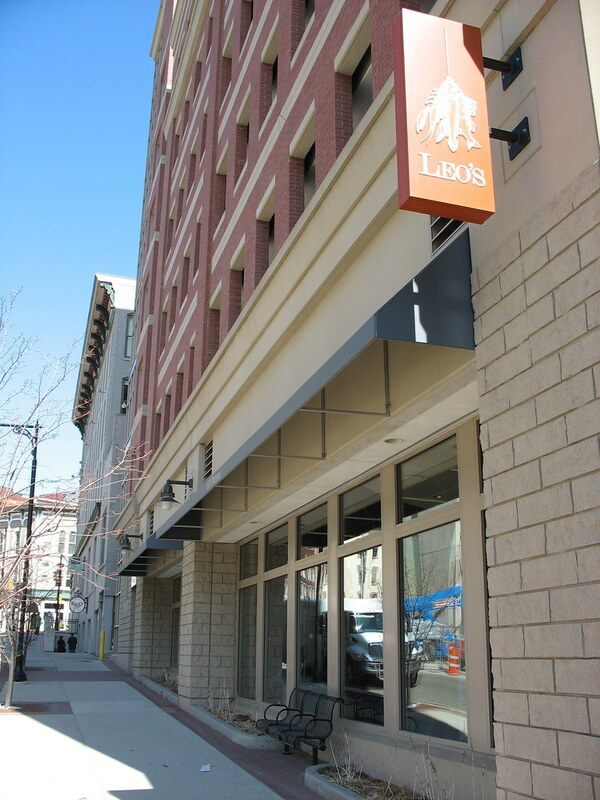 Building owners are encouraged to provide retail or personal service uses at the street level. In buildings without such uses, other active uses of visual interest to the pedestrian may be displayed, including office or lobby areas, pressrooms, showrooms, classrooms, kitchens, or manufacturing processes. 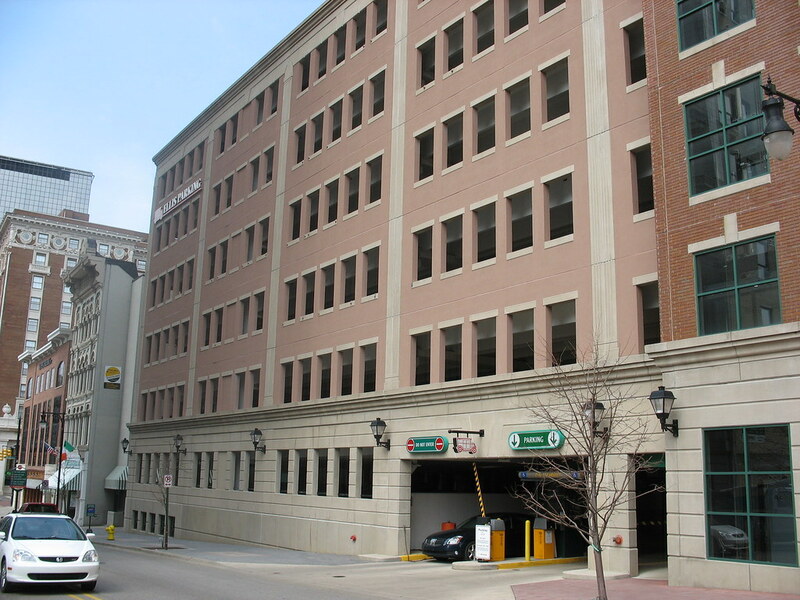 Parking areas, truck loading areas, and vehicular accessways are not active uses. (b) Modification. The Planning Director may modify the facade transparency requirement where sloping grades make the introduction of windows impractical. Apologize for continuing to harp on this. In fact, the same discussions about ground floor design aspects is going on simultaneously on almost every city page on UP. Here's a discussion in Atlanta. Is this in GR's future? Yikes, some of these street images are downright frightening, yet I'm sure there is a lot of commerce going on in the floors above. 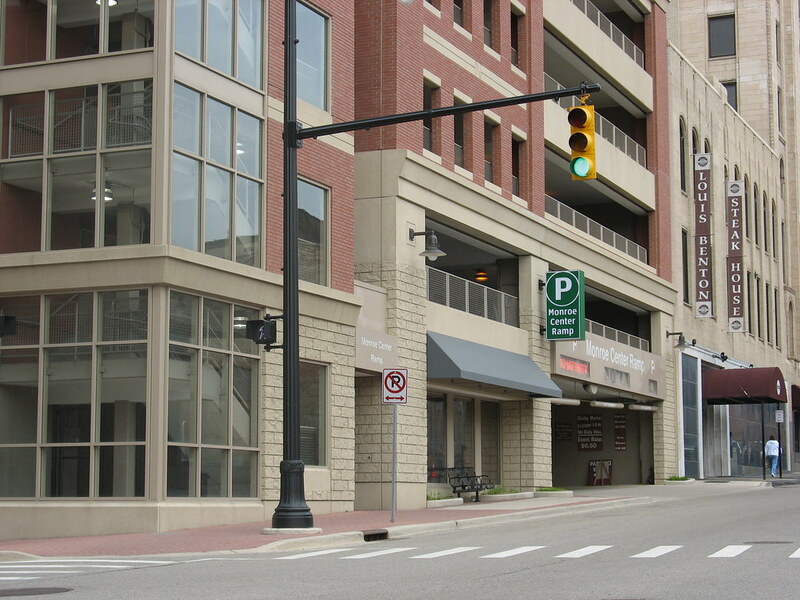 If you look at the big empty parcels downtown like the 5/3 lot, Lyon&Ottawa, Market&Fulton, Ionia&Fulton and a host of others, if a project gets built with on-site parking, they're probably going to put the parking partially underground and on the lower floors. 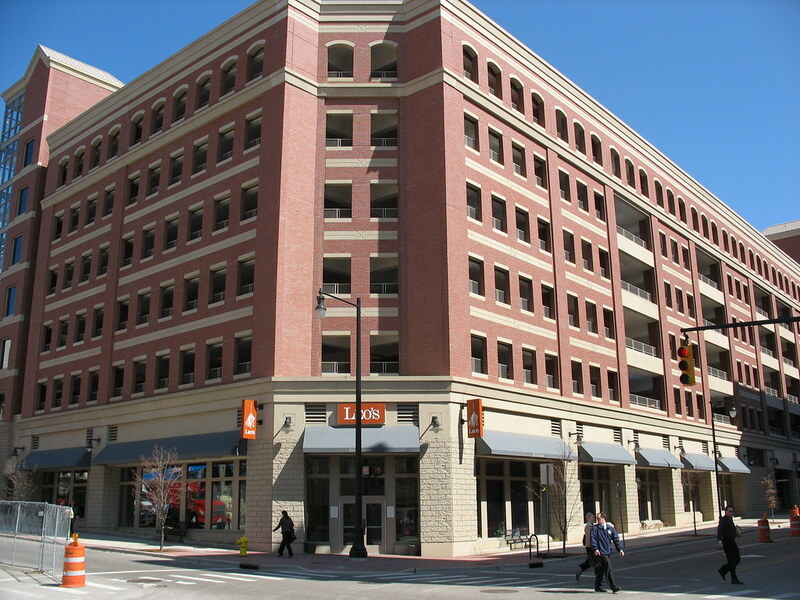 Right now the code is "OK" for normal uses on the ground floor as far as transparency and retail goes, but is pretty lenient for ground-floor treatment of parking structures. Those pictures are worth thousands of words. Eeegads. How do we make sure that doesn't happen (from here on out) here? 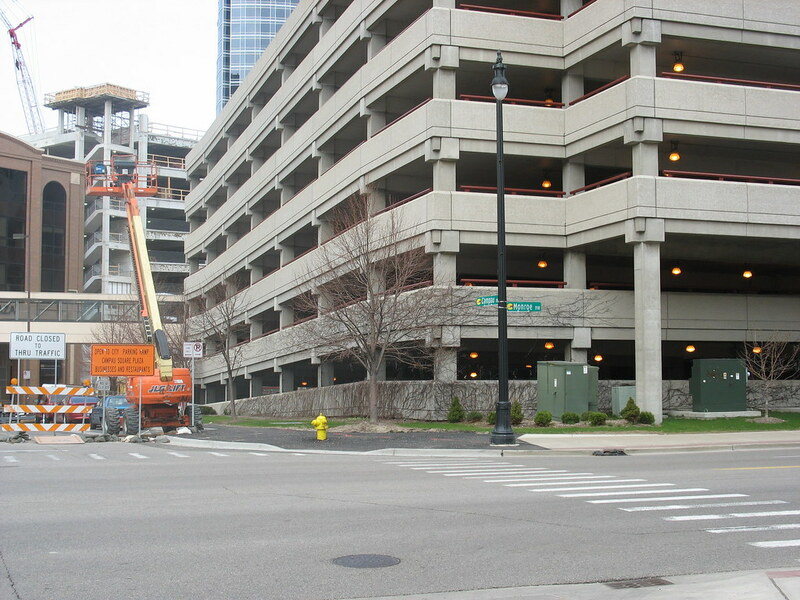 Michigan Street hill at ground level in 5 years? Campau with all the skywalks going in?? C. Parking Structures. 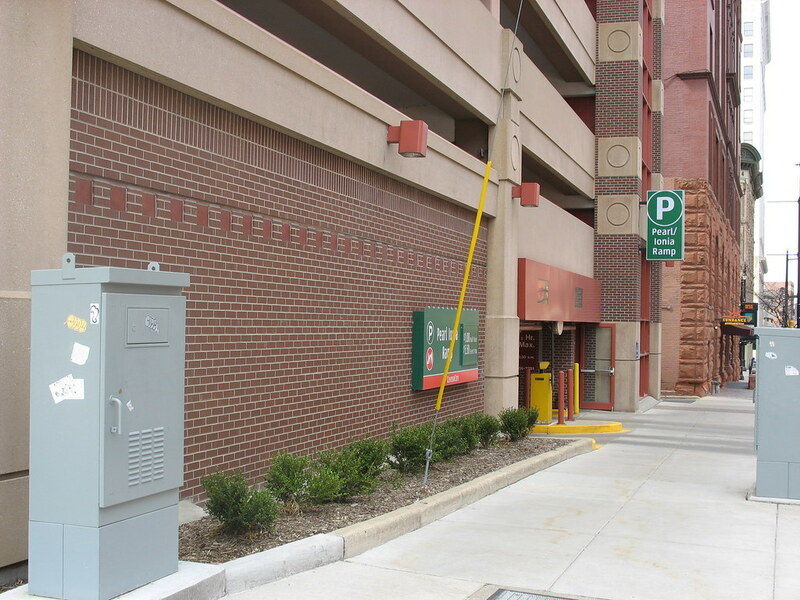 Wherever practical, structured parking facilities shall be designed with retail, office or other permitted uses at the street level. Where this is not possible, the structure shall have an architecturally articulated facade designed to screen the parking areas of the structure, to encourage pedestrian scale activity, and to provide for urban open space. 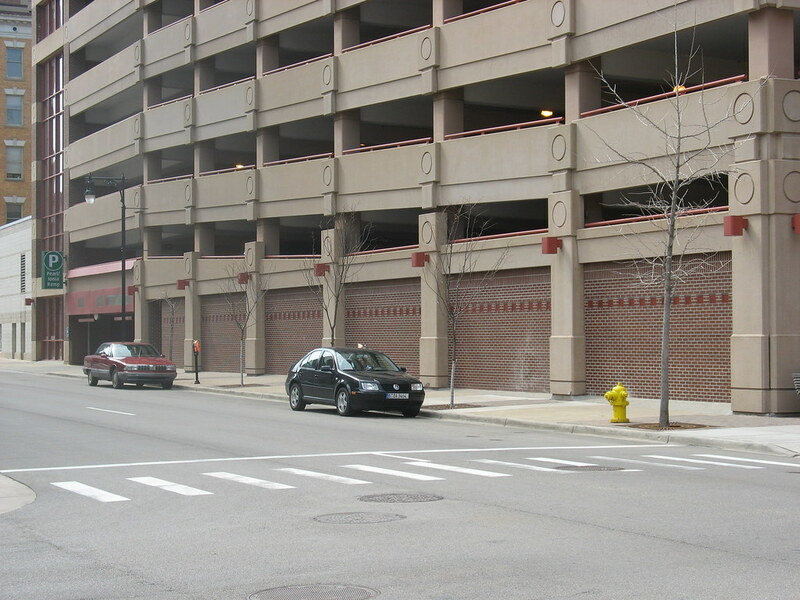 Where automobile access is provided, two smaller openings are preferable to one large one. Who defines when this is "not possible"? I'm sure every big developer out there can raise a stink that it's not possible on the ground floor of any development, and that it will be a burden on them to be competitive (this is called a negotiating tactic) so then it defaults to architectural "screening", which I'm sure most of these Portman buildings would pass the mustard and is very subjective. That's why I think section C needs a good thorough review by the city to see if it is enforceable and will achieve the desired results (of an aesthetically pleasing environment for pedestrians). 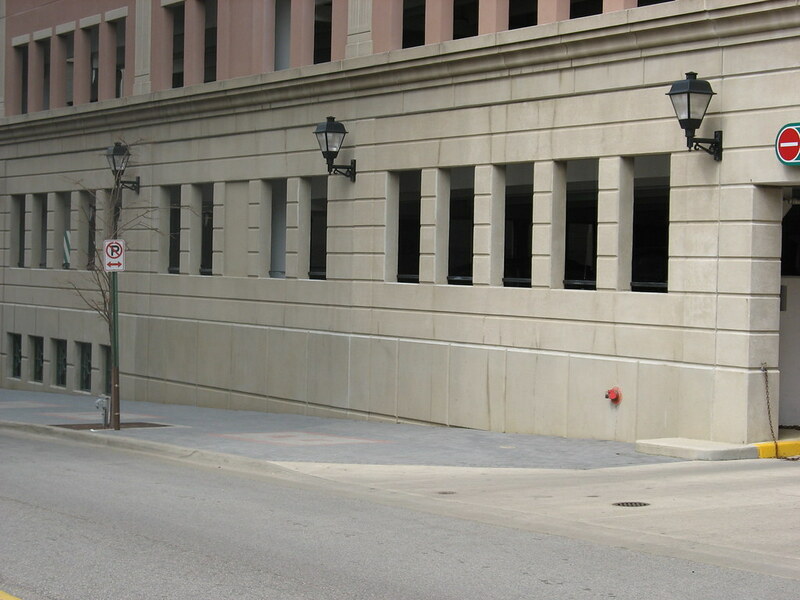 They're putting an awful lot into the Streetscape Guidelines, perhaps this should be part of it? Those photos are actually kind of creepy. I almost expect to see zombies limping down the street. Unfortunately I think scenes like that are common all across the US. Unlike most other countries we've pretty much razed our core cities with a few notable exceptions like New York, Chicago, and San Francisco. (I'm sure they saw their share of urban renewal as well though.) Even Canada which has a very similar urban pattern to the US hasn't torn down their cities like we have in the US. While ground floor transparency is important, it is only a single component to the intricacies associated with the urban retail storefront. All of these components need to be dealt with carefully in the construction of a new storefront...and it is clear that much of this nuance is lost on people making storefronts today. The following are some of these components that will ultimately make the built environment better. They all need to be scutinized when one designs and builds a storefront. The performance specification of saying 80% clear glass is nice, but it alone will not deliver the appropriate pedestrian scaled experience that is needed. If everyone of those ramps would be like Monroe Center with Leo's, I'd be pretty happy.